Professional Flat Iron Hair Straightener - Only $21.95 + FREE Shipping w/Prime! Check out this Professional Flat Iron Hair Straightener on Amazon for Only $21.95 + FREE Shipping w/Prime! This would make a great holiday gift idea!! We, at Perfecter, are all set to help you style your hair the way you want. This product combines an essential flat iron hair straightener with an efficient hot round brush. It’s up to you if you want straight, curly or wavy hair for the day, as you can have it all with this FLAT IRON/HOT BRUSH COMBO. For straight hair you can use the Flat iron. For wavy hair you can use either the Hot Brush or the Flat iron. 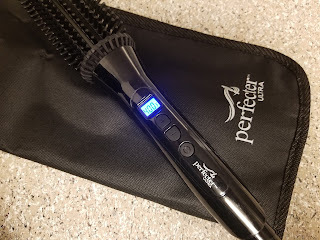 For curly hair use the Hot Brush. FLAT IRON HAIR STRAIGHTNER: To access the flat iron hair straightener, all you have to do is unlock the brush to open. The hair straightening iron features tourmaline plates that offer incredible energy efficiency. The Flat Iron Plates are floating and ionic. This means, no worries about burning your hair or having a sudden pull on your hair. 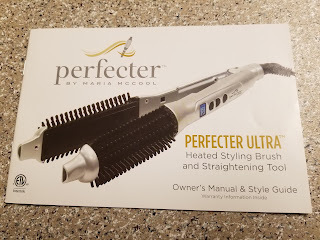 With the hot round brush & styling flat iron, or a combination of the two, you can well-and-truly express your personality through your hairstyle. HOT ROUND BRUSH: The hot round brush features a body of ionic ceramic. It provides a firm grip for easier maneuvering. Precisely spaced nylon teeth help you achieve just the right style for you. The hot round brush uses dual heaters to spread the heat uniformly & quickly, without heating the nylon tips. No More Guesswork! This hair straightening brush features a digital temperature control system with 3 temperature settings (380, 400 & 420 degrees) & a LCD display screen. Unlike ordinary hair straighteners, our product also features a reliable auto shut-off system for users safety. 1 INCH CERAMIC IONIC PLATES FLAT IRON – 7 INCH OUTSIDE DIAMETER HOT BRUSH - For all hair types out there – get smooth and silky hair results – Wavy hair, straight hair or even curly hair with this professional salon flat iron/hot brush combo! 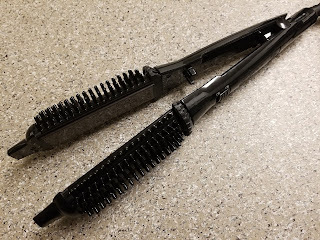 You can either use the flat iron itself, the hot brush itself or both together! Flat iron plates are ionic and floating, that means no burning and no pulling!! The hot brush teeth are nylon, for a no burn, no tangle, no pull and no slip experience! 420F INSTANT HEAT LCD DIGITAL DISPLAY: Perfecter Ultra flat iron/hot brush combo has 3 temperature settings, 380F, 400F and 420F. Features Digital control, power and temperature. 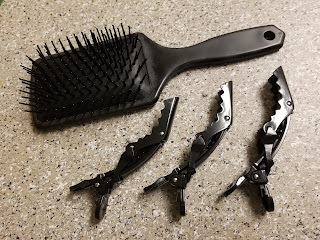 Also features a manual lock option to lock the flat iron closed – which is great when using the hot brush itself or when styling while ironing – so no one should get hurt. INNOVATION! 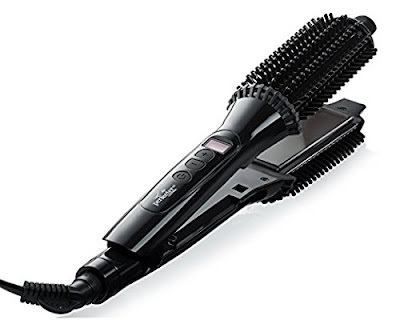 : This flat iron/hot brush features 45 second heat up – 3 minutes to max heat – 60 minute auto shut off function for your safety, 360 degree swivel cord for easy maneuvering AND dual voltage compatible for traveling! 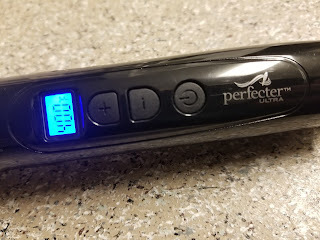 This is a wonderful hair straightener at a really great price!